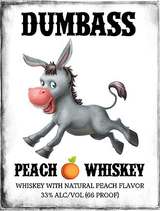 Dumbass Peach Whiskey is a Social Lubricant Bursting with the taste of Sweet Ripe Peaches. Man Up and have a Shot!! !